With the Rhyl Triathlon the latest addition to the Xtra Mile Events calendar for 2013, the inaugural open water Rhyl Triathlon took place on Sunday 9th June 2013 in glorious sunshine. 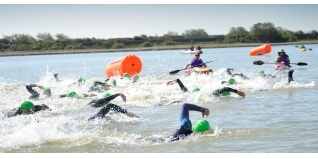 Based at Rhyl Marine Lake the triathlon incorporated both a sprint and a standard distance race, giving athletes of all levels the opportunity to take part. 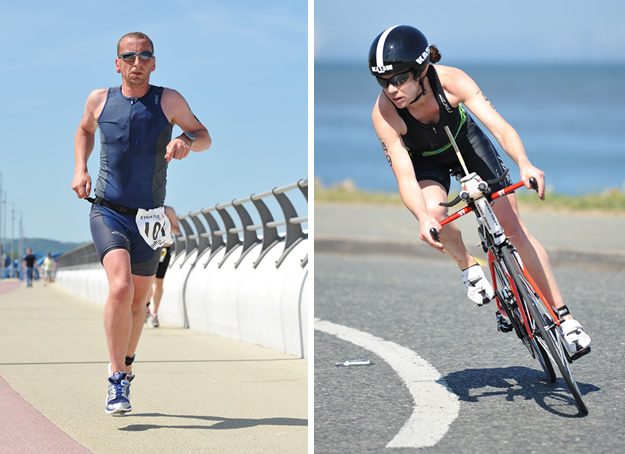 Offering top class facilities, a clean, sheltered environment for the swim and stunning scenery for the cycle route and run, the Rhyl Triathlon has been hailed a success by everyone involved with a total of 133 athletes crossing the finish line. In the standard race Glenn Parry Jones took the overall title in 2:06:02, securing his win after a very fast cycle. Runner up Mark Clair (Knowsley Harriers AC) crossed the finish line only six seconds after Parry Jones following a strong performance in the water and a fast run. Paul Mannion from Manchester Triathlon Club came third in 2:10:11. In the women’s race Sarah May from Calderdale Tri Club put in yet another outstanding performance and won in a time of 2:14:50, placing herself in an excellent overall sixth position overall. Catherine Jennings (Wallasey Athletics Club) came second in 2:26:42 after a consistent performance across all three disciplines. Jen Dickson dominated the swim leg and put in a strong performance on the bike but lost time on the run and finished in third place in a time of 2:29:00. The sprint distance race was won by Andrew Jones in a time of 1:03:22, ahead of Phillip Lynes in 1:05:26. Andrew Taylor came third in 1:05:55. The women's field was dominated by Leah Collis who was fastest in all three disciplines and completed the course in 1:18:33, nearly nine minutes ahead of runner up Suzanne Jamieson-Evans. Clare Logan took third place in an overall time of 1:27:57. Simon Hill, race organiser commented: "I would like to express a big thank you to everyone who has supported us in bringing the first Rhyl Triathlon to Rhyl. We are grateful to Denbighshire County Council and in particular Carol Evans of Rhyl Going Forward, whose vision and drive have played a major part in the event’s success. We are also grateful to Rhyl Sea Cadets, Rhyl Swimming Club, Rhyl Hockey Club, Rhyl Football Club, BTF Referees and Manchester Medical Services for their help with staging this event, and all the other support groups without whom this event would not be possible. 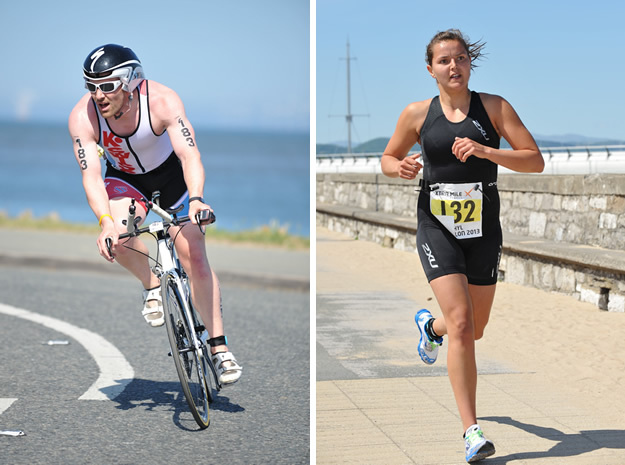 "Rhyl Marine Lake is the perfect location for a triathlon, surrounded by Denbighshire countryside which makes for a great backdrop for the cycle and run legs of the triathlon. We have seen some fantastic performances today, well done to everyone who competed and took part. We already have ambitious plans for 2014 to improve the event and make the Rhyl Triathlon a must-do event for the triathlon community and Rhyl residents." Sponsors of the Rhyl Triathlon 2013 included Rhyl Going Forward, Up & Running (Official Sports Retail Partner), Edinburgh Bicycle Co-operative (Official Bicycle Retail Partner), Starley Bikes (Official Specialist Bike Brand), USN Ultimate Sports Nutrition (Official Nutrition Partner), Zone3 (Official Wetsuit Partner), Clif Bar (Official Energy Bar Partner), Aftershokz (Official Headphone Partner) and Athlete Matters (Official Physio and Rehab Partner). The full results are available on http://www.xtramileevents.com/results . Other races in North Wales organised by Xtra Mile Events include the award winning Llandudno Sea Triathlon on 29th June and the The Eirias Middle Distance Triathlon on 3rd August 2013, entry to both of which is still open. Please go to www.xtramileevents.com for further details and to register, like the Facebook page www.facebook.com/TriathlonUK and follow Xtra Mile Events on Twitter @GreatTriathlons.